If you love fashion, dancing, and party games then you will love this Bratz Party! Join Chloe, Jade, Sasha and Jasmine with this unique party. These fashion divas with their large heads, lush make-up and trendy clothing are an iconic dream of many young aspiring musical and fashion orientated girls. 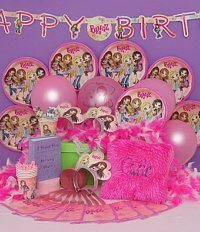 This Bratz birthday party will create many glitzy and trendy memories. Get everything you need for your Bratz Party in this Party Pack! Fashion Show Dress Up Have the girls select their outfits (feather boas, hats, glamorous dresses, shoes / boots). Then move onto hair and make-up. The finale will be the fashion show. Get clothing from your closet, borrow from friends or visit a second hand shop (you never know what you may find). Glamour Shoes Pick up some plain shoes / boots in the girls sizes before the party. Have the girls decorate them with gems, sequins, ribbons, etc. Let them become the designers. (If using a hot glue gun be very careful with adult supervision – have yourself or a friend do the hot glue gun part). If you can’t find the shoes look for sunglasses to decorate. Guess Who Bratz Style Stick pictures / names of the Bratz characters on the back of the guests. They have to ask yes and no questions to their friends to figure out which character they are. Hip Hop Video Create your own video! First teach the girls a few simple moves (or hire someone in). Then let the girls create their own moves. Create a music video for them. Microphone Dare Play music and pass the microphone. When the music stops the person holding the microphone must continue singing the song, sing another song, or dance along to the music they were listening to. This will create lots of giggles. Best Friends Bracelets Have lots of beads to select from, for the girls to become jewellery designers. Have an assortment of beads to choose from … glass, wood, plastic, letters, etc. They can make necklaces, bracelets, earrings, etc. Watch one of the Bratz movies.